Need a car electrical repair service in Covina? If so, then you can stop searching “auto electrical mechanic near me”, because we have the best technicians in the area at Johnny’s Auto Service! A vehicle’s electrical system controls an extremely wide variety of its parts, ranging from minor things like your car’s radio, major features like airbags or alarms, all the way to the most crucial systems, your air conditioning and heating. When any of these systems fail it is important for both your convenience and safety to ensure that you take it to a qualified shop in order to get them fixed as soon as possible, and there is no one more qualified than our staff of professionals. Here at Johnny’s Auto Service, we can feel confident in boasting the title of one of the best car electrical repair shops in Covina, thanks to our team of experts. 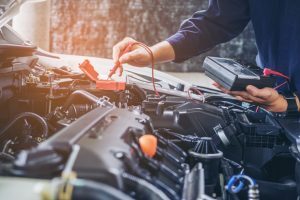 The technology for a vehicle’s electrical system continues to get more and more complex, requiring a greater degree of skill and knowledge in order to ensure a smooth repair. Thankfully, our team of ASE Certified Technicians is equipped with cutting-edge technology and the most up-to-date training and knowledge in the field of auto repair, providing you with the peace of mind that comes with the knowledge that each repair to your trusted vehicle is being performed by professionals under the best possible conditions possible. When looking for “auto electrical mechanic near me” online, you’ll find that our auto repair shop consistently comes in at the top of the list. We have built a reputation of trust and high-quality repairs over years of service to the Covina area. If you have been experiencing problems with certain systems in your vehicle, then you should schedule an appointment with us as soon as possible! Give us a call at (626) 966-5212 or visit our shop, we will be happy to assist you in setting up an appointment with our team in order to get you and your vehicle safely back onto the road as soon as possible!